As alluded to previously in these pages (is that what they are? ), I have been perplexed for quite some time about the speed at which the craft beer culture is moving. Last summer, there was some talk here and there about "event fatigue," a reference to the fact that it was difficult to keep up with the blitz of events. I still think the pace of beer events peaks in the summer. But it's starting to stay crazy all the time. For instance, there were a bunch of events this past weekend: The Winter Nano Festival in Tigard, the Hillsdale Brewfest, Lompoc's Shrimp Boil and Chowder Challenge, Double Mountain Tap Takeover (NW Bottles) and the Beer Mixology Hat Trick at Guild Public House. It's quite possible I've missed an event or 10. Related to this is the pace of new beer releases. It's quite insane. Virtually every brewery is pushing out new, experimental beers on regular basis. There was a time not so long ago when you walked into a brewpub and knew their standards and typical seasonals. That's less possible today, as the list of standards is often pared down, and the list of seasonal offerings has grown. Why has this happened? Why do breweries, pubs and promoters feel the need to stuff the calendar with special events and new beer releases? The momentum of this trend has gone completely off the hook over the last couple of years. What's the deal? The answer has something to do with a monumental shift in the way marketing and advertising is done today. 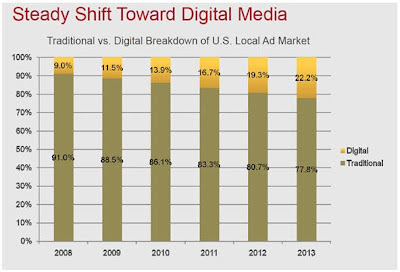 The trend toward more digital marketing was already underway when the economy crashed in late 2008. When the crash came, expenditures on all kinds of marketing tanked. It's not so surprising. People weren't buying anything. Why advertise? 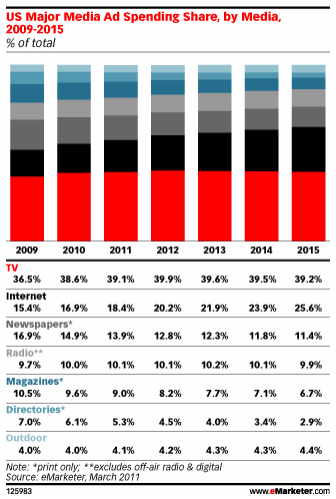 TV advertising has been pretty stable and will evidently stay that way. 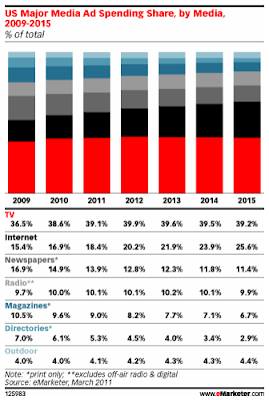 Newspapers and magazines never recovered from the recession and are being displaced by digital. Internet (digital) advertising is growing steadily and will continue to do so. TV has done well because Americans love it. Despite the challenges of time shifted (DVR and online) viewing, television continues to draw advertisers who can afford to pay for it (lots of national brands). Why? Because TV audiences are huge and represent the demographics advertisers want to reach. It's important to note that some of the lines between television, digital and even print are becoming blurred. If you watch a YouTube video on your TV, how should that be counted? If you go to a newspaper website to read a story or watch a video, what's that? My guess is that newspapers will get better at selling web-based ads, which will help them survive in digital form. But traditional newspapers are going the way of the dinosaurs. Back to the original question: How does the shift toward digital media marketing relate to the craziness in the craft beer scene? That's where this was leading, right? Yup. Look, social media marketing is a perfect fit for the craft beer industry. It enables breweries and pubs to establish connections with customers that would be impossible and prohibitively expensive with "blast" mediums like TV or print. Facebook, Twitter are highly effective, targeted marketing mediums. Here's the catch: In order to stay engaged with fans, you've got to constantly provide fresh content. That objective takes on the form of special events, beer release parties, small festivals, chowder challenges and a whole lot more. Craft brewers use these activities to revitalize their relationship with beer fans. I still contend the beer community could do a better job coordinating the event calendar. How? I'm not really sure. Maybe it doesn't matter. Maybe having a ready supply of possible destinations at any given time is a good thing. Time reveals all. The shift of advertising to digital marketing is a big step because this medium is inexpensive and yet it's very effective. I hired a California SEO company for the business I just started and now it's becoming known after just a few months.